Below is a brief update on issues and events which you/your organisation might take up as part of the ongoing campaign to support workers and social movement activists in Kazakhstan. 1. Berik Zhagiparov is a workers’ leader in Zhezkazgan . I met him there in November last year when I was in Kazakhstan for the congress of the independent trade union, Zhanartu. 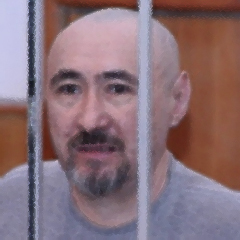 His ‘crime’ was organising a demonstration of protest against Kazakhmys – a gigantic conglomerate employing 50,000 workers. It mines and processes metal and trades on the London Metal Exchange. Our Campaign organised protests, including handing in a large message at the company’s headquarters in London. Unusually, my letter received a response – a very defensive email from an English-speaking representative of Kazakhmys called John Smelt. He claimed that Kazakhmys recognises trade unions. However, it seems that the only trade unions that the company recognises are ones that they can control. The spark that led to Berik’s arrest was probably the fact that the workers themselves had, for the first time, elected their own leader. Kazakhmys’ response was to try and establish a new “stooge” union which would be compliant. It would be helpful if supporters could continue to e-mail the company (via john.smelt@kazakhmys.com) querying which unions the company recognises and requesting that unions other than those that agree with management be allowed to organise. 3. Aron Atabek, the renowned Kazakh poet, who was given an 18 year prison sentence for trying to defend the shanty town of Shanyrak against the bull-dozers, remains in jail. He recently ‘celebrated’ his 60th birthday in detention and has been moved on to a special, solitary confinement regime. The authorities have tried to break the spirit of this inspirational activist but have not succeeded. He is allowed to receive letters and the authorities should be reminded of the widespread indignation of his supporters around the world by: 1) Letters being regularly sent to him at: Uch. UK-161/12, posyolok Severnyi, Arqalyq, zip:110300, Kostanayskaya oblast, Kazakhstan 2) Protests being sent to your local embassies/consulates condemning Aron’s further detention – demanding his release and the dropping of all charges against him. Also included in the demands for freedom should be the three other activists arrested with Aron:- Erganat Taranshiev, Kurmangazi Utyegenov and Rustem Tyakov. (Please send copies of your messages to www.campaignkazakhstan.org so that we can publicise on the web-site the amount of support/protests being expressed. 4) Contact your local office of PEN International – the organisation that campaigns on behalf of imprisoned writers – about Aron’s case. You can find their address on the internet via: http://www.pen-international.org Please keep checking the website for more detail on these and other developments in Kazakhstan. Please also continue to send in protests when needed. They do have an impact on the Kazakhstan authorities and they raise the spirits of activists in Kazakhstan. We also appeal to you to make donations and raise funds for the campaign. Campaign Kazakhstan was set up in Brussels by Paul Murphy, Euro MP for Dublin. In the UK we have been successful in getting the support of a growing layer of trade unions and individuals. We will be holding a General Meeting to formally elect a steering committee on 7 April. All affiliated individuals and organisations are invited to participate. This entry was posted on 28 February, 2013 in homepage and tagged Aron Atabek, Berik Zhagiparov, Campaign Kazakhstan, Erganat Taranshiev, John Smelt, Kazakhmys, Kurmangazi Utyegenov and Rustem Tyakov., Mick Whale, Vadim Kuramshin, Zhanartu, Zhezkazgan. Bookmark the permalink.